Members of Team Lowe's, the no. 48 Lowe's Chevy Monte Carlo driven by Jimmie Johnson, hustle during a pit stop in the 2009 Coca-Cola Classic 600 race at the Lowe's Motor Speedway, in Concord, NC. NASCAR Driver David Reutimann won his first Cup race during the rain-shortened event, held May 25, 2009. 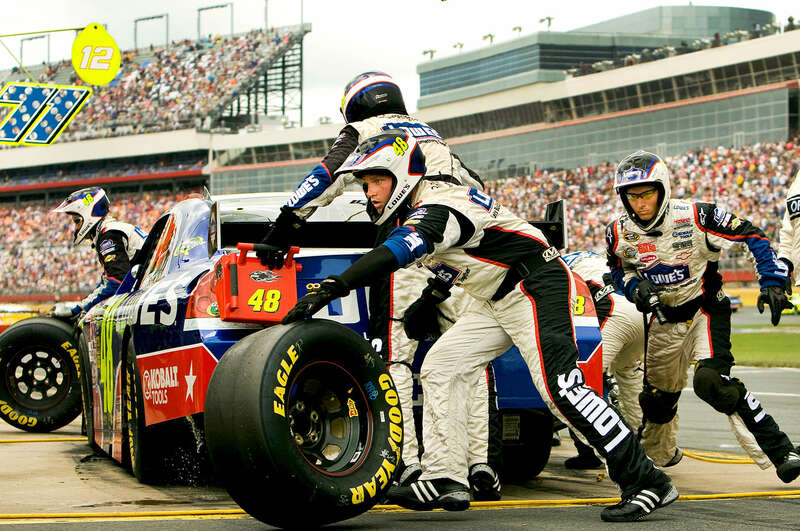 NASCAR's longest scheduled race went only 227 laps, or 340.5 miles, before officials ended it because of rain. The 2009 race was the 50th running of the Coca-Cola 600. Ryan Newman and Robby Gordon finished second and third respectively.